The scarecrows will soon be making their yearly appearance on the lawn of the Haywood County Courthouse in Brownsville. The annual scarecrow competition will be held Saturday, October 10, beginning at 5 p.m. Winners will be announced and prizes awarded during the evening when judges have made their final decision. The annual contest is free and open to all age groups. Judging will be in two categories; children and adults, with cash prizes awarded for 1st ($100), 2nd ($75) and 3rd ($50) place in each. A gift package will also be awarded to the overall “Most Creative” entry. All participants are encouraged to be present at the time of judging. Groups and organizations are encouraged to participate, as well as school classes and individuals. You do not have to be a Haywood County resident. Scarecrows can be made of any natural materials, but cannot depict an actual person. A complete list of rules and regulations can be found online at www.hatchiefallfest.com. If you have a great idea for a scarecrow, there is still time to enter. Entry forms will be accepted until noon, Friday, October 9. Enter online at www.hatchiefallfest.com, stop by the Delta Heritage Center, 121 Sunny Hill Cove, or call 731-779-9000 for more information. 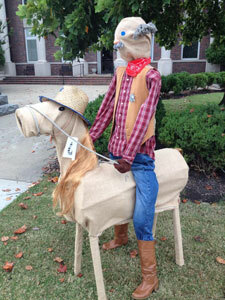 (Photo): Madison Haak’s sheriff and horse won second place in last year’s scarecrow competition. Scarecrow of various character and sizes surround the Haywood County Courthouse during the annual contest to be held Saturday, October 10. Scarecrows remain on exhibit for the Hatchie Fall Fest on October 17.